Leading hospitality company sbe, is pleased to announce the opening of Mondrian Doha, marking the famed luxury hotel brand’s first property in the Middle East, and a new level of vibrancy and round-the-clock entertainment to the West Bay Lagoon. To celebrate, Mondrian Doha will set the stage for its black tie grand opening celebration in late October that promises to be an outstanding showcase of the property. 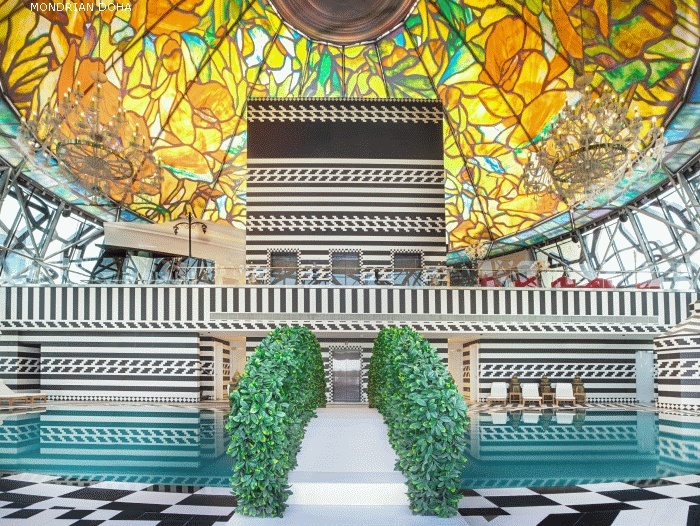 The eye-catching and unique hotel offers exceptional lifestyle luxury with 270 rooms, designed in collaboration with world-renowned Dutch designer Marcel Wanders and South West Architecture. 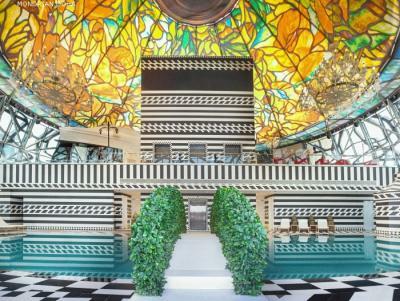 The hotel is a fantasy-like environment, true to the Marcel Wanders design and sbe ethos. It offers five distinctive room categories including penthouse suites, studio suites, one and two bedroom suites and a range of standard guestrooms. Located on the 23rd floor of the property, the penthouse suite offers incredible attention to detail combined with panoramic 360-degree views of Doha’s landscape. Throughout the hotel, Wanders’ signature floating staircase and hand-painted One-Minute Delft blue vases set a striking and sophisticated atmosphere, while locally-inspired features such as custom-designed Dean Majilis sofas and a “cabinet of information”, connects guests with the fascinating history and culture of the region. 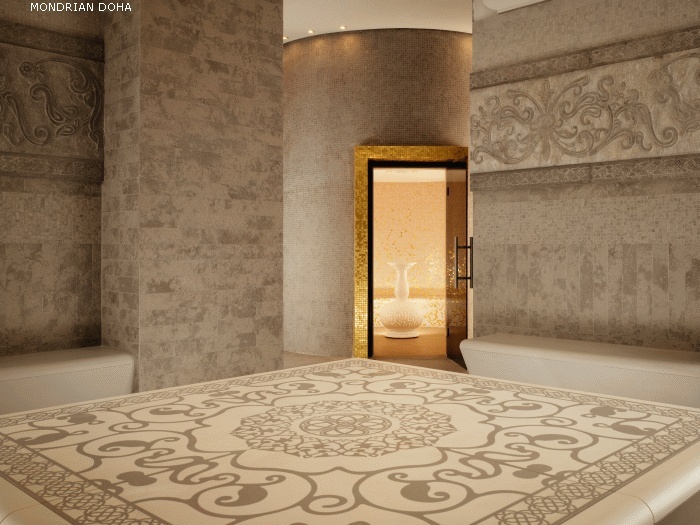 The renowned property also boasts the largest ESPA Spa in the world, with the 2,000 square metre spa featuring separate spas for men and women, eleven treatment rooms, a spa within the spa, and Hammam areas. In addition, Mondrian Doha has a 24-hour fitness centre and a rooftop pool. Mondrian Doha is also a culinary emporium; with seven restaurants and bars, offering new and un-paralleled experiences in Qatar. This includes CUT by Wolfgang Puck, Morimoto, Magnolia Bakery and a number of other ‘first to market’ concepts including Walima, a Qatari- inspired restaurant. The hotel will offer a variety of impressive new venue options for event planners and delegates in Doha. On the ground floor, the remarkable and expansive 2000m2 Moonstone Ballroom can be adapted to suit every occasion using creative technology, from lavish weddings and award ceremonies to larger functions and presentations. A further 500m2 of flexible function and conference space is capable of handling events for 10-300 guests. All rooms can be configured according to specific needs and equipment required. Facilities include a boardroom, full service business centre, as well as production, wardrobe, make-up and casting rooms. High-speed wireless internet is available throughout the hotel. Additional hotel facilities will include an entertainment floor complete with a nightclub, rooftop pool and SKYBAR. Mondrian Doha is located in the heart of West Bay, next to Lagoona Mall and Lusail City, the future of Qatar with its innovative design, architecturally led landscape making and the gateway to Qatar’s next major city destination. 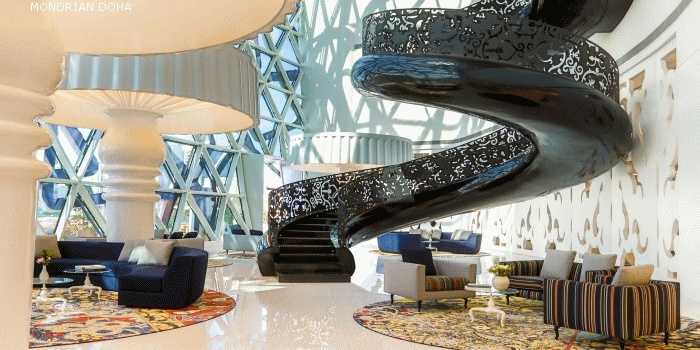 The Hotel was designed in collaboration with famed Dutch designer, Marcel Wanders, making it Wanders’ first Hotel in the Middle East. 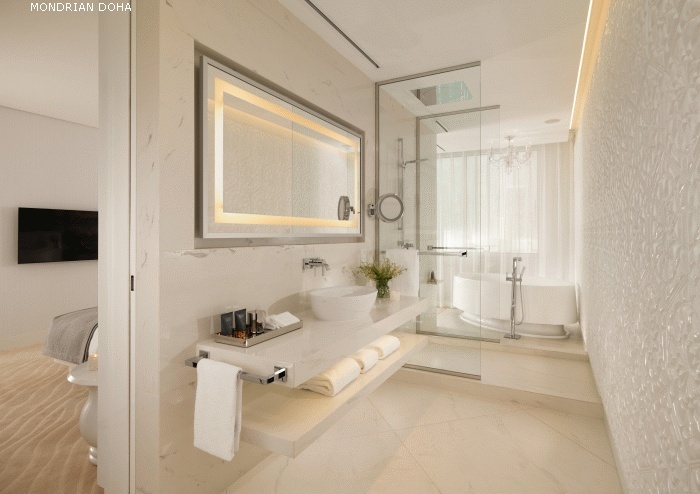 Mondrian Doha comprises of 270 distinctive rooms; including the Penthouse studios and Studio suites with 59 suites in total, in addition to 211 bedrooms, over 24 floors. All of the rooms feature bespoke miniature artworks, luxurious custom-made furniture and Swarovski crystal chandeliers, as well as signature nuances by Wanders. Mondrian Doha is recognised for its luxurious lifestyle hospitality offering which includes four restaurants showcasing both local and international cuisines; Morimoto, CUT by Wolfgang Puck, Walima and Hudson Tavern. As well as two bar outlets; Rise and Black Orchid, in addition to Magnolia Bakery in its lobby lounge. Mondrian Doha has one of the largest ballrooms in Qatar, a 2,000 square metre ballroom with a private elevator access and VIP Bridal Suite, along with private meeting rooms. Established in 2002 by Founder and CEO Sam Nazarian, sbe is a privately-held, leading lifestyle hospitality company that develops, manages and operates award-winning hotels, residences, restaurants and nightclubs. Through exclusive partnerships with cultural visionaries, sbe is devoted to creating extraordinary experiences throughout its proprietary brands with a commitment to authenticity, sophistication, mastery and innovation. Following the acquisition of Morgans Hotel Group, the pioneer of boutique lifestyle hotels, sbe has an unparalleled global portfolio featuring over 20 world-class lifestyle hotel properties in 9 attractive gateway markets and more than 136 global world-renowned hotel, entertainment and food & beverage outlets. The company is uniquely positioned to offer a complete lifestyle experience - from nightlife, food & beverage and entertainment to hotels and residences, and through its innovative customer loyalty and rewards program, The Code, as well as its award-winning international real estate development subsidiary, Dakota Development - all of which solidify sbe as the preeminent leader across hospitality. 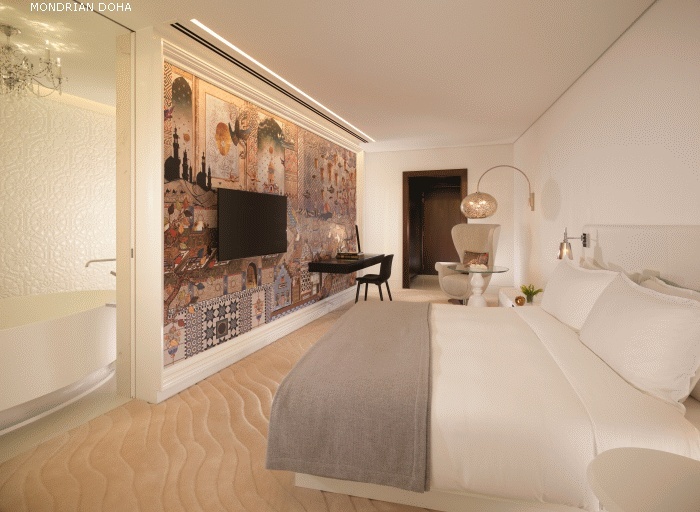 sbe will continue its expansion with 13 hotel properties opening in the next two years (some with residences), including SLS Baha Mar, SLS Seattle, Mondrian Doha and Mondrian Dubai. The company's established and upcoming hotel brands include SLS Hotel & Residences, Delano, Mondrian, Redbury, Hyde Hotel & Residences, Clift, Hudson, Morgans, and St Martins Lane. In addition, sbe has the following internationally acclaimed restaurants and lounges: Katsuya, Cleo, The Bazaar by José Andrés, Fi'lia by Michael Schwartz, Umami Burger, Hyde Lounge and Skybar. More information about sbe can be obtained at sbe.com. South West Architecture (SWA) is a Grade "A" Architectural and Engineering Consultancy accredited by the Urban Planning & Development Authority (UPDA) for Local Consultancy Engineering in Architectural, Civil Engineering, Mechanical, Electrical and Electronic Engineering. It is one of the leading Architectural and Engineering Consultancy firms in Qatar.